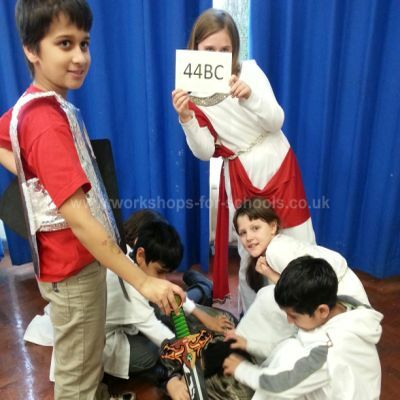 The Romans...Ancient Rome and Roman Britain, fact packed, fun workshop day. Roman civilization, Roman Britain, The Roman Army and every day life in Roman times. 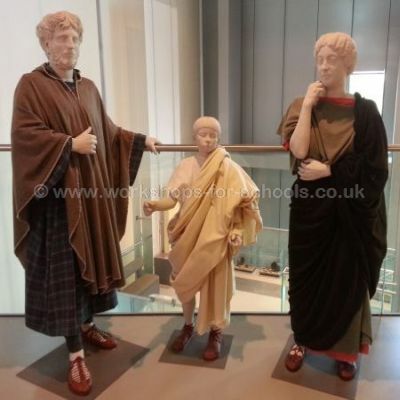 Roman Day is pitched at key stage 2 children and will enhance their understanding of Roman culture, who the Romans were and how they lived. The visit can be tailored to your requirements. You can choose to have the focus on Julius Caesar, The Claudian Invasion and Conquest, the power of the Roman Army, Romanization of Britain and Hadrian's Wall. 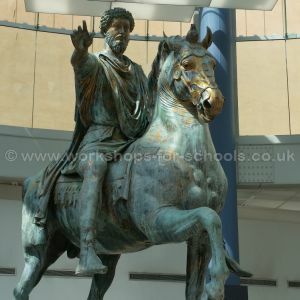 Alternatively you can have a more general look at the Romans, Roman civilization, famous Romans, The Roman Army etc. We explain the importance of roads and towns, transportation and trade within the Empire. The children will have the oportunity to see a wide range of Roman artefacts and clothing, plus military weapons and equipment. 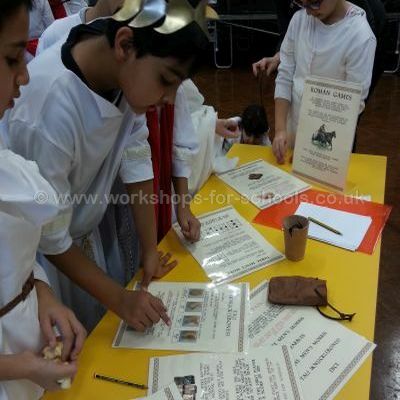 They will also take part in practical activities relating to life in Roman times. Children taking part in a Roman soldier activity. Here they are trying out the famous "Tortoise" formation. 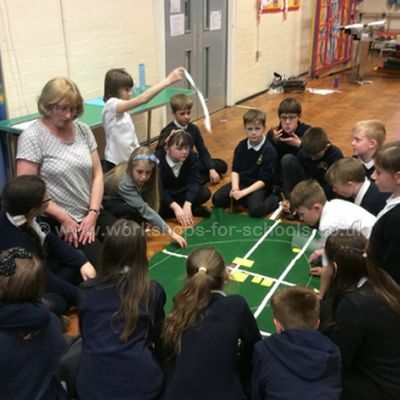 These children are involved in a timeline activity based on events relating to the invasion of Britain. The children will get to see a full set of Roman soldier armour, weapons and equipment. We explain why the Roman army was so effective, its basic organization, training and tactics. We bring an interesting selection of artefacts. Here Ron is showing a wax writing tablet and explaining its use. They also see papyrus and wooden tablets similar to those found at Vindolanda on Hadrian's Wall. Roman towns were essential to government. Here the children are learning about the layout of a typical Roman town and the key buildings which would be found in most of them. Activities are set out in the school hall and children working in groups take a turn at each one. 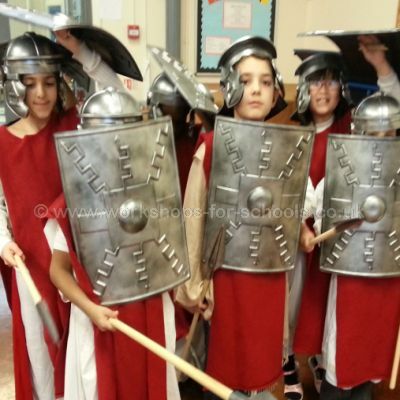 In some schools the children do dress up for Roman Day. These children have really gone to town on their costumes. Although not essential it does add to the fun of the day. The toga was an important garment worn by male Roman citizens. Ron demonstrates how a toga is put on and worn. How many children can take part? One or two classes is comfortable, three at a push. Do you need the school hall? Having the use of the hall is ideal but not essential. 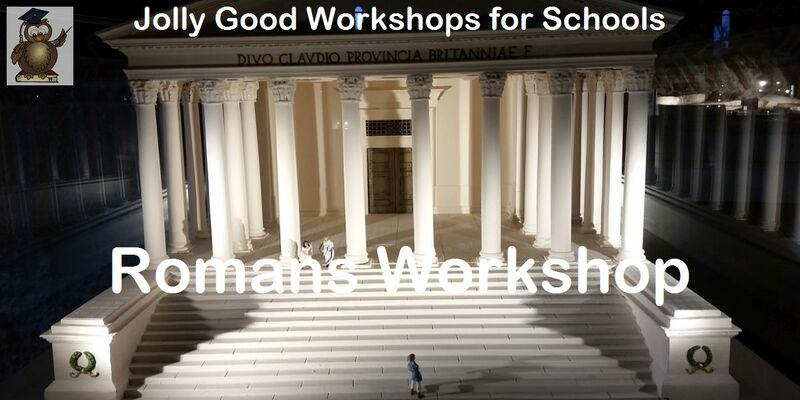 Do you work in secondary schools? Yes, we can work in secondary schools. Can the infants join in? 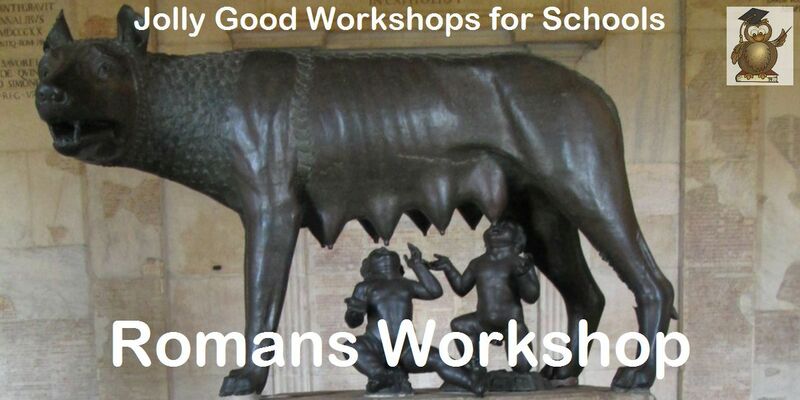 No, this workshop is not really suitable for KS1. What is the format or the day? When you submit an enquiry we will reply with a quotation and some notes about how the day is organized together with outline timings. We require a computer, projector and screen in the morning and staff to help run activities in the afternoon. These can be parent helpers. 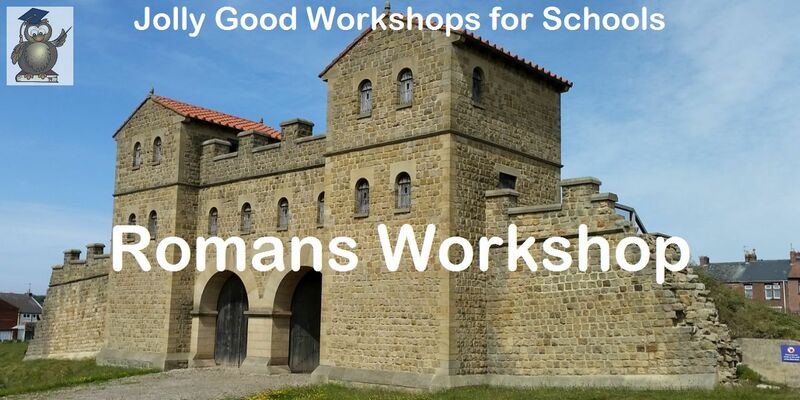 Highly recommended workshop. Planned and executed brilliantly by Ron 'Romulus' Wood. Came fully prepared with a full day's activities and the children were thoroughly engaged throughout the day. Child led activities for the afternoon were pitched and resources very well and the history lesson in the morning was both informative and interesting. If you have Romans as a Topic this is a perfect way to open the topic. Thank you Ron. The children in Year 2 had a fabulous afternoon learning all about Ancient Rome. They were fully engaged from start to finish and were very disappointed when home time came around! The presenter, Ron Wood aka Ronulus, was very lively and humorous and I would fully recommend the workshop to anyone interested in Rome. Would strongly recommend to other schools. Really fun and engaging activities, a very interesting presentation and overall a fabulous day! Thank you very much. 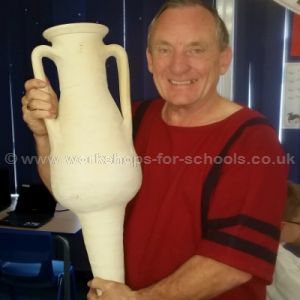 We booked Ron to do a Roman Workshop for our two Y3 classes and it was the perfect hook to engage the children in their learning! Ron's knowledge was in depth and he was able to put the information across in a fun, interactive way. 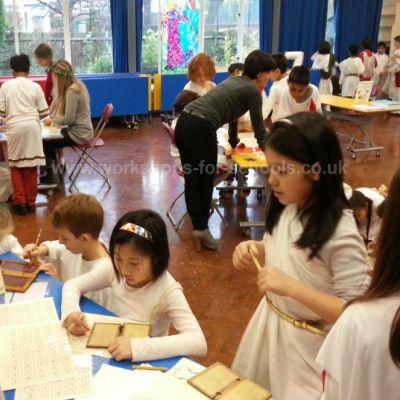 In the afternoon we played Roman dice and board games, wrote on wax tablets, acted out a slave auction, created colourful mosaics, communicated like Roman soldiers did using codes and the children got to use play-spears, helmets and shields to practise Roman Army drills. The children absolutely loved the day. They were very engaged and excited throughout and asked lots of questions. Ron was professional, friendly and very helpful in suggesting how best to organise the day to best fit the children's needs. He had a brilliant way with the children; they were giggling all day at his jokes and they loved him. He had the children in the palm of his hand!! 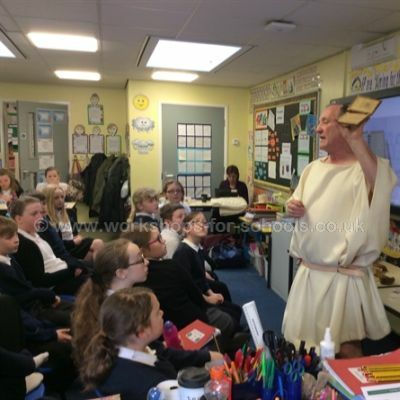 Would highly recommend Ron to any school doing the Romans topic, and I will definitely book him again. 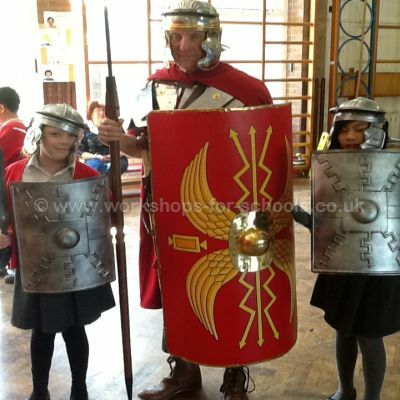 We had Ron in yesterday doing a Roman day for 50 year 3 and 4 students. Ron's energy, enthusiams and knowledge was outstanding. In the afternoon Ron had 9 different activities for 50 students in groups of 5-7. All the activities were engaging, suitable for the children, educational and most of all very fun. Having 'Ronulus' visit was a great way to finish off out Roman topic.